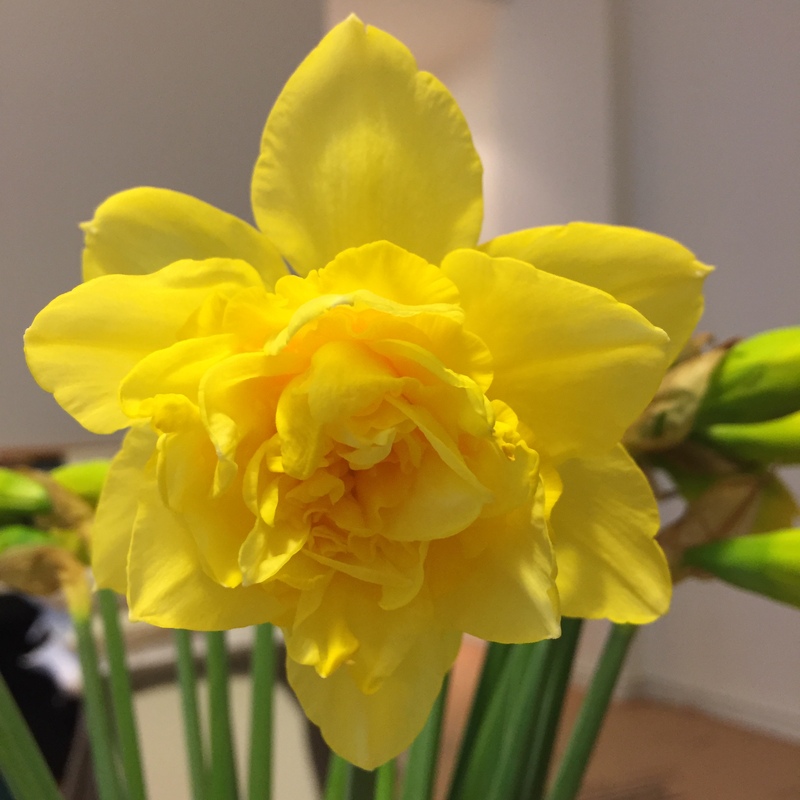 Oh how time flies… the days are already getting longer and the market flower stalls have been selling bright yellow daffodils for weeks. 2016, it seems, is almost a quarter over! A few months ago, a group of us kicked off the New Year in style with a workshop titled: ‘Working with Paper: Gendered Practices in the History of Knowledge’. This is a new working group project that I’m running with my colleagues Christine von Oertzen and Carla Bittel. The project examines the intersections of histories of paper technologies and paperwork, gender history and histories of knowledge. By merging the analytical frameworks of material culture and gender, we aim to reveal how notions of masculinity and femininity became embedded in, and expressed through, uses of paper. Some of you old timers who’ve read this blog from our launch in 2012 might recall that I have previously written about recipes, note-taking and paper technologies (here, here and here). Indeed, the many ways in which householders used paper tools such as notebooks, slips, tables, cut outs etc. to contain, filter, shift recipe knowledge has long been an interest of mine (for example, see this presentation). More recently, though, I have also become fascinated with how householders used paper to contain, filter and shift materia medica, medicines and foodstuffs during processes of production. That is, I began to wonder not only about paper technologies but also technologies using paper. In my contribution to the ‘Working with Paper’ project, I play with combining these two analytical strands – the narrative on paperwork and paper technologies and the narrative on gender and everyday technologies. In doing so, I hope to investigate the multiple ways in which housewives and household managers used paper ‘technologies’ both in performing quotidian tasks and in codifying practical knowledge. This focus on the materiality of paper, I hope to suggest, offers a new perspective to link the collection and management of knowledge and hands-on practices on the ground. 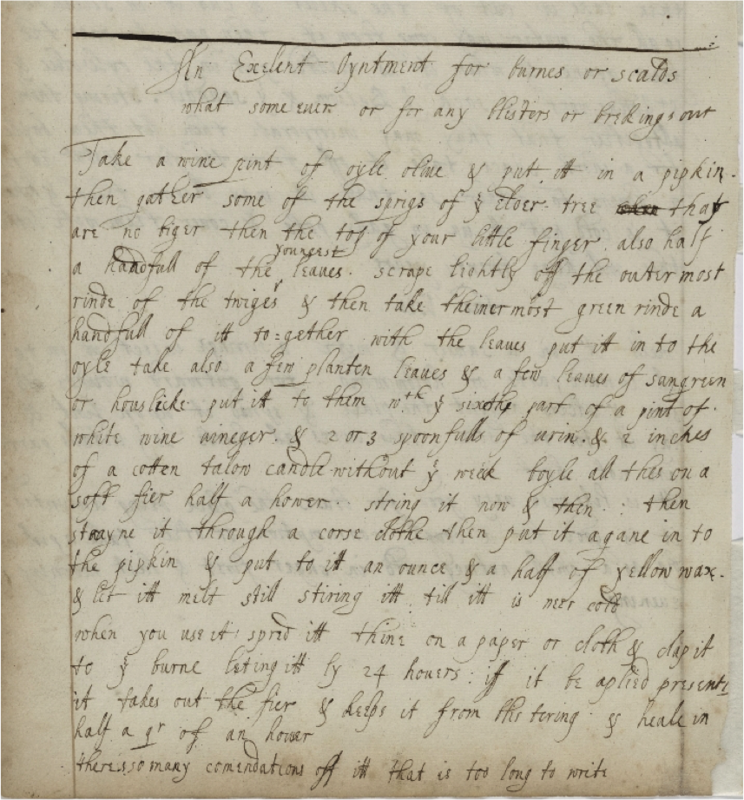 To further investigate paper use in all sorts of recipes, I turned to the recently transcribed recipe books of Johanna St. John and Rebeckah Winche (click here for more on the transcription process). Using the trusty ‘search and find’ function, I located just over 30 recipes which featured paper in some way. It turns out that paper (of all sorts, more on that in a minute) was widely used in a number of home-based everyday technologies for the production of a wide range of medicines and foodstuffs. Wellcome MS 4338, fol. 15v. One of the most common uses of paper was as a means to apply ointments, salves and so on to the body. 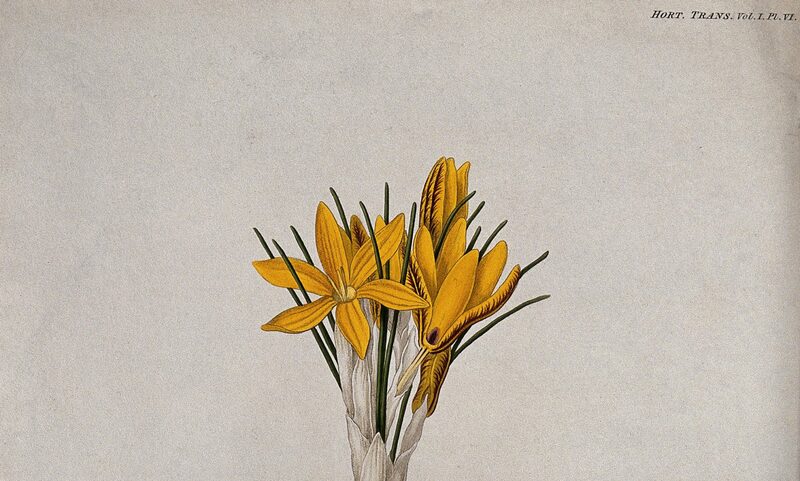 For example, in a recipe ‘for a cancer’ by Lady Honeywood in the St. John recipe book, the maker is instructed to take the juice of herbs (featherfew, celandine, rue and smallage), mix it with beanflower and honey and spread it on the softest brown paper. If the cancer sore is already an open sore, then the practitioner should lay the paper next to the sore, changing twice and day and burning the paper afterwards. Wellcome MS 4338, fol. 18v. In another recipe for a “knubb or hardness’ in the breast, the maker is instructed to first dip brown paper in brandy, spread honey on the paper and lay it onto the breast, changing the paper plaster as it were, every day or two. This simple plaster, we’re told will dissolve the lump in a around month. ‘Paper plasters’ were also used in medicines to soothe burns. For example, in Rebekah Winche’s book, a ointment for a burn or scald involves boiling elder tree bark and leaves, plantain leaves, houseleek, olive oil, white wine vinegar, urine and wax and dipping paper or a cloth in this mixture and ‘clapping’ it to the burn. In these cases, recipe makers and medical practitioners play on the fact that paper is both malleable and absorbent; thus making them good carriers to deliver medicines continually to the surface of the body. Here, paper joins other materials such as leather and cloth in this role. Indeed in some recipes, like the burn recipe in the Winche book, paper and cloth were used interchangeably. Folger MS v.b. 366, fol. 62. Analysis of early modern household recipes show that paper was also used in a number of other ways. For example, oiled papers were used to shape, contain and preserve rolls of pills. Cap paper was often used to filter and separate liquid mixtures and to protect glass objects. The more expensive white paper was also used in these everyday technologies; perhaps surprisingly, it was commonly used to dry and preserve fruits and vegetables. In the interest of space (those pesky editors and their word limits! ), I can’t talk about all these uses today but I promise to write more on these very soon. I’m still at the beginning of my research on paper use in everyday household technologies and am enthusiastically collecting examples. So, if you happen to come across any recipes with paper use, please do get in touch. Our friends on the Zooniverse Shakespeare’s World site, have started a channel ‘#paper’ for recipes encountered over there. I can also be reached via comments below or at recipes@mpiwg-berlin.mpg.de. Thanks so much in advance – I’m super appreciative for all your help!